The Federal Supreme Court has ruled that the two mountain landing sites at Gumm and Rosenegg-West will definitely be closed at the end of September. A two-year legal dispute has led to this final decision. The Saanen, Grindelwald and Innertkirchen municipalities filed a complaint against the closure of the Gumm and Rosenegg-West mountain landing sites, following the decision by the Federal Department for the Environment, Transport, Energy and Communications (DETEC) on 15 December 2016. After a ruling by the Federal Administrative Tribunal in favour of the appeal, the Federal Supreme Court then overturned this decision and confirmed the closure of the Rosenegg-West and Gumm mountain landing sites as announced by DETEC on 16 December 2016. The Court ruled that both landing sites would close on 30 September 2019. DETEC has justified the closure of the Rosenegg-West and Gumm mountain landing sites: "These sites are only of medium importance for training pilots and commercial flights, which doesn't justify the fact that they’re in conflict with the countryside, nature and protecting the environment. On the other hand, as far as all other airstrips are concerned, it's more important to maintain air traffic operations and there's less potential conflict with the conservation of nature and protecting the environment." The argument put forward by the respondents, ie the three municipalities, doesn’t seriously question this assessment and doesn’t make it seem unreasonable. "Even if the potential conflict posed by the Col des Mosses landing site was high as opposed to medium, this wouldn't reduce the potential conflicts posed by the Rosenegg-West and Gumm airstrips." Also, the comments about the importance of the soon-to-be closed landing sites in terms of training and commercial flights are by no means unreasonable. "It's true that these landing sites are no less important for training and tourism than other sites. However, DETEC did take into account the fact that the approach routes are longer." The Alpine protection organisation Mountain Wilderness Switzerland has also had to respond to the ruling by the National Administrative Court by carrying out a mandatory review of all mountain airstrips. "The decision by the National Court is taking us down a path we didn’t really want to follow. Instead of carrying out a legal and transparent review where everyone's interests are suitably balanced, we've been presented with a blanket compromise and the closing of two landing fields," said a spokesperson. After the closure of the two mountain airstrips at Gumm and Rosenegg-West, Switzerland still has 40 remaining mountain airstrips. 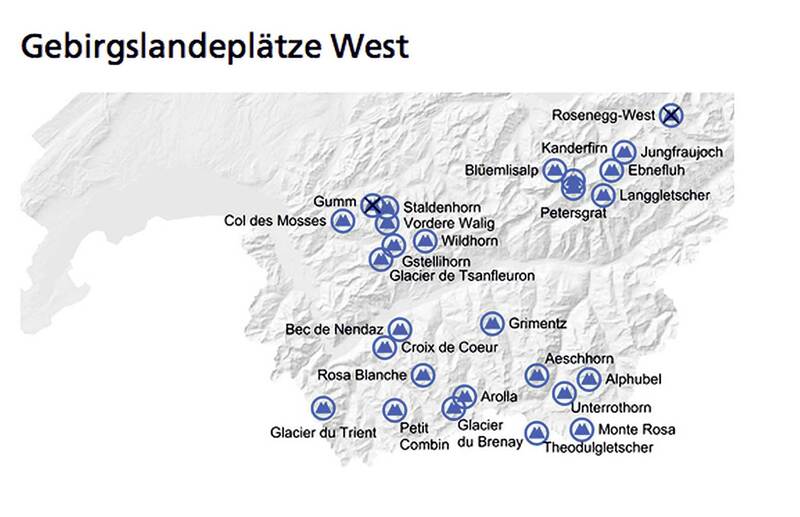 There are six in our region: Staldenhorn, Vordere Walig, Gstellihorn, Wildhorn, Col des Mosses and Glacier de Tsanfleuron.